Founded in 1010, Vietnam’s capital Hanoi has a fascinating history that combines French and Chinese colonisation with Vietnamese culture. Beautiful lakes, interesting historical attractions and excellent food make Hanoi a great destination for anyone visiting Vietnam. As the centre of political life in Vietnam for over 1,000 years, Hanoi is home to a wide range of interesting temples, museums and historical buildings. 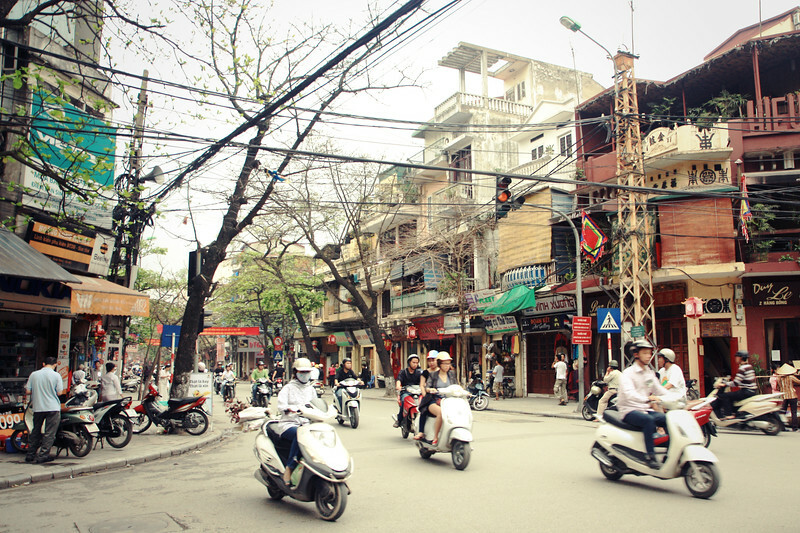 Modern Hanoi combines ancient life in Vietnam with modern development, busy traffic and constant activity. (For more about Hanoi’s history, see my Hanoi travel story). 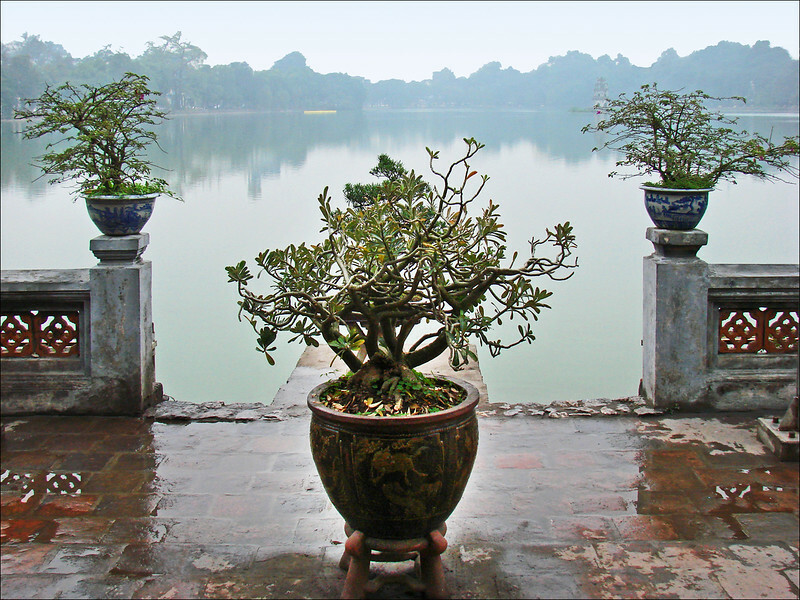 Aside from historical attractions, there’s a huge amount to do in Hanoi. From beautiful lakes to a great selection of restaurants and bars, Hanoi is an increasingly modern city that’s great for short holidays and longer trips alike. Known for its beautiful colonial architecture, Hanoi’s Old Quarter is home to several of the city’s historical attractions. The Old Quarter itself contains a great selection of artisan shops offering handcrafted clothing, shoes and other products, as well as the usual market items. Dong Xuan Market, Hanoi’s largest indoor market, is located close to the Old Quarter in the central Hoan Kiem District. Located in Hanoi’s historic centre, a short distance from the Old Quarter, Hoan Kiem Lake is one of Hanoi’s major landmarks. The lake is the location of an ancient legend involving the Lê dynasty emperor Lê Lợi. The area around Hoan Kiem Lake is home to several of Vietnam’s largest companies. Turtle Tower, a monument to the legend involving emperor Lê Lợi, sits on an island in the middle of the lake. The Temple of the Jade Mountain is also located on a small island in the lake. West Lake is the largest lake in Hanoi — a large lake (its shoes measure 17 kilometres) that’s surrounded by hotels, parks and public areas. West Lake is the location of several of Hanoi’s most luxurious hotels and a popular recreational area for residents of the city. Ba Dinh is Hanoi’s political district. Filled with imposing Soviet-style buildings and government offices, this part of Hanoi is where you’ll find attractions like Ho Chi Minh’s Mausoleum and a range of museums and monuments dedicated to Vietnam’s independence. Use the search box below to find out departure times and prices on your selected travel dates to Hanoi. The Temple of Literature a beautiful Confucian temple and the site of the Imperial Academy — an ancient university established in 1076 to educate Vietnam’s political and cultural elite. The temple is one of Vietnam’s most famous attractions — you’ll find it on the 100,000 dong note. Divided into several different buildings and courtyards, the temple complex contains a series of stunning historical buildings. The Temple of Literature can get crowded with both tourists and locals late in the day, so visit early in the morning if you’d like to avoid the crowds. Vietnam’s revolutionary leader Ho Chi Minh played a central role in the country’s struggle for independence from France, and eventually in the Vietnam War. His embalmed remains are displayed in the Ho Chi Minh Mausoleum, a Soviet-style tomb in Ba Dinh Square. Inspired by Lenin’s Mausoleum in Red Square, the Ho Chi Minh Mausoleum is guarded by a team of Vietnamese military guards. Visitors need to be dressed well in order to be admitted, with full length trousers and covered shoes. No photography is allowed in the mausoleum. Built as the official residence of the French Governor General during Vietnam’s period as part of French Indochina, the Presidential Palace was converted into a government building after Vietnam achieved independence. Although Ho Chi Minh never officially lived in the residence — he refused it for because of its symbolism of French imperialism — he built a small stilt house close to the palace that’s open to the public today. Despite its aged and worn down exterior, St. Joseph’s Cathedral is still used for mass and as a place of worship for Vietnam’s surprisingly large Catholic population. This impressive 19th century cathedral, built in the style of Notre Dame, is a major landmark in Hanoi. The B52 Victory Museum contains a selection of impressive war machines from the Vietnam War, including an American B52 and various Soviet anti-aircraft missiles. The museum isn’t particularly comprehensive, but worth a quick visit if you’re interested in the Vietnam War. 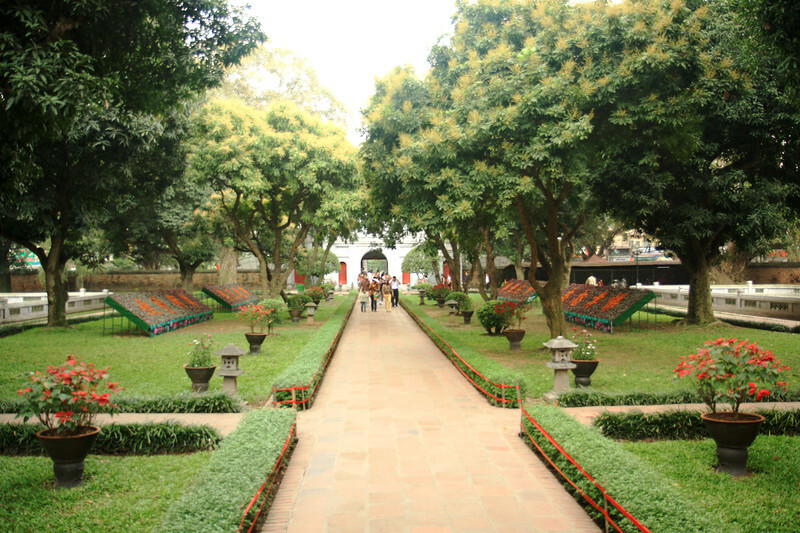 Located close to Hoan Kiem Lake, the National Museum of Vietnamese History covers almost all of Vietnam’s history. The museum, which is located inside a 1930s colonial building, is an excellent place to brush up on your understanding of Vietnam’s recent and ancient history. Another great museum within walking distance of Hoan Kiem Lake, the Vietnamese Women’s Museum covers the role of women in Vietnam’s history. The museum’s exhibits cover a wide range of topics, from women’s fashion to historically significant Vietnamese females. Although it may not seem it at first glance, Vietnam is an ethnically diverse country with over 50 different official ethnic groups. The Vietnam Museum of Ethnology covers the diverse and interesting history of the numerous ethnic groups that have inhabited Vietnam. A refreshing change from Hanoi’s numerous revolutionary and war museums, the Vietnam National Museum of Fine Arts showcases a large collection of Vietnamese fine art covering the entire period of Vietnamese history and culture. Located on the 72nd floor of the supertall Keangnam Hanoi Landmark Tower, Sky 72 offers amazing views over Hanoi. Access to the observatory’s 5D cinema and trick art gallery is included with admission. Built in 1901 and renovated in 2014, the Sofitel Legend Metropole Hanoi Hotel is a historical hotel close to Hanoiís Hoan Kiem Lake. The hotelís elegant rooms and luxurious pool make it a fantastic place to escape from the hustle and bustle of Hanoi. Sleek and modern, the Lotte Hotel Hanoi offers a selection of rooms and suites in a high-rise tower offering excellent views of Hanoi. The hotelís facilities include indoor and outdoor pools, a rooftop bar and restaurant and several luxurious lounges. Located in Hoan Kiem District, Hanoiís commercial and historical centre, Moevenpick Hotel Hanoi has a great selection of elegant rooms and suites. The hotel is conveniently located close to several of Hanoiís most popular attractions such as Hoan Kiem Lake. Located inside the Old Quarter, Hanoi La Siesta Hotel and Spa is a beautiful French colonial hotel offering a selection of spacious and comfortable rooms. Rooms are tastefully decorated and include free Wi-Fi access. Located a short distance from Hoan Kiem Lake, Meracus Hotel 2 is a convenient mid range hotel ideal for travellers that want to be close to the centre of Hanoi. A wide variety of rooms, from doubles to family suites, are available. Tryst Hotel is a modern, comfortable and clean three-star hotel located close to Ba Dinh — the political centre of Hanoi. With a great location, clean and comfortable rooms and free Wi-Fi in all areas, itís a good choice for travellers seeking convenience in Hanoi. Blue Hanoi Inn Hotel is a simple but comfortable three-star hotel located close to Hoan Kiem Lake in the centre of Hanoi. The hotelís top floor restaurant offers good views over Hanoi and the surrounding area. Located in Hanoiís Old Quarter, Hanoi Garden Hotel offers colonial-style rooms at extremely affordable prices. This two-star hotelís spacious rooms are furnished with modern furniture and include free Wi-Fi. Another Old Quarter budget hotel, Hanoi Elegance Ruby Hotel offers a selection of simple but comfortable rooms and suites. With just 20 rooms, this small boutique hotel is a great place to base yourself while you explore Hanoi. Located inside the Old Quarter, Gia Ngu is an upmarket Vietnamese fusion restaurant with a great menu, strong cocktails and a range of excellent desserts. Located close to the Old Quarter in Hoan Kiem District, Cau Go serves tasty Vietnamese food from an upper floor location with great views over Hoan Kiem Lake. Forest Vietnamese Restaurant is a charming Vietnamese restaurant in the fashionable district of Tay Ho. Rustic decorations and live music make this a fun choice for a memorable dinner. El Gaucho serves excellent steaks and Western dishes, making it a good choice if you need a break from Vietnamese food. Note that prices are quite high, even by Western standards. Located inside the JW Marriott Hanoi Hotel, French Grill serves a tasty French menu and one of Hanoi’s best Sunday brunches. Minh Thuy’s Family Restaurant serves high quality Vietnamese food and a great selection of Western dishes. Prices are extremely reasonable for the quality of the food on offer. 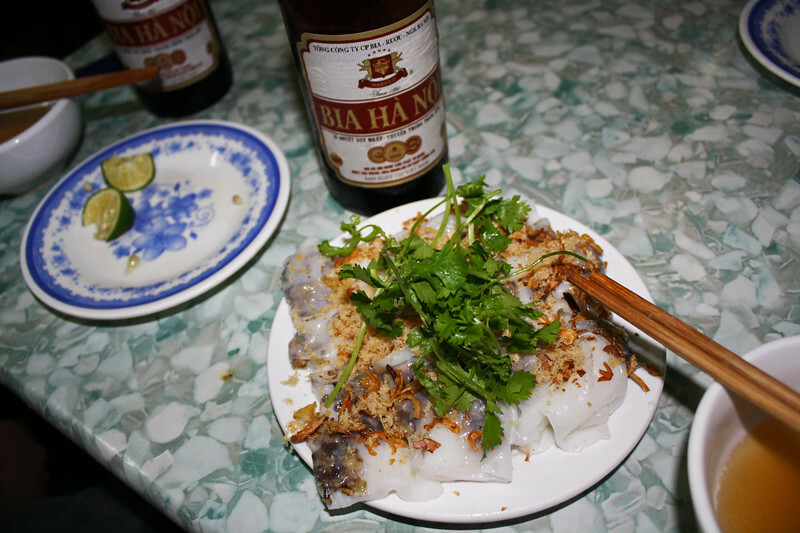 Pho Thin is widely regarded as one of Hanoi’s best pho restaurants. The menu is simple — in fact, there’s only one item — and decorations minimal, but the pho is excellent and extremely affordable. A short walk from Hoan Kiem Lake, Mon Hue Restaurant serves great Vietnamese food and good coffee at reasonable prices. No visit to Vietnam is complete without trying banh mi — Vietnamese-style sandwiches made with a fresh baguette. Banh Mi 25, located on Hang Ca Street, is a great banh mi shop and café. Bun Bo Nam Bo offers no-frills Vietnamese dining in the centre of Hanoi. The restaurant itself is simple and far from luxurious, but the quality and taste of the food is outstanding. 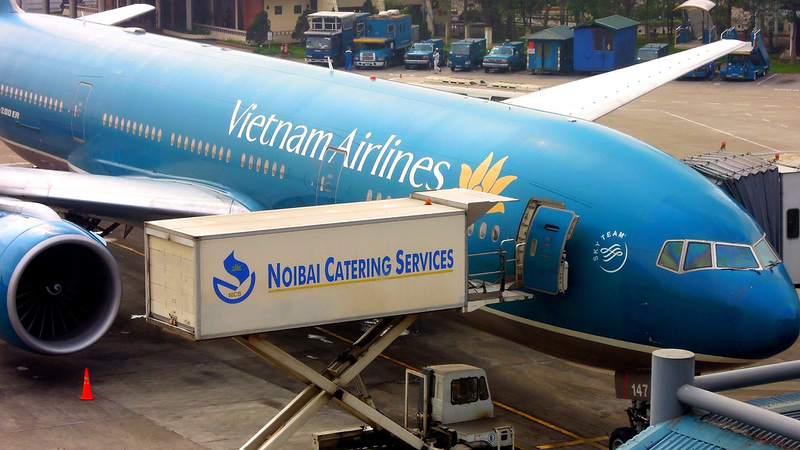 Noi Bai International Airport, Vietnam’s second largest airport, serves Hanoi. The airport is easy to reach from elsewhere in Southeast Asia, with frequent flights from Bangkok, Kuala Lumpur, Singapore, Phnom Penh and other regional centres. Domestic flights from Saigon, Nha Trang, Da Nang, Da Lat and other major Vietnamese cities to Hanoi are available on a frequent basis. Check Skyscanner to compare airlines for the best prices and flight times to Hanoi. The Reunification Railway runs north-south down Vietnam, connecting Hanoi with cities like Da Nang in Central Vietnam and Saigon further south. Although Hanoi is connected with the other major Vietnamese cities, train travel in Vietnam is notoriously slow. If you’re travelling from Saigon to Hanoi by train, be prepared to spend upwards of 30 hours onboard throughout the trip. All domestic trains arrive at Hanoi Station in Hoan Kiem District. Hanoi is easy to reach by bus, with private buses travelling between Hanoi and other major destinations such as Hoi An, Hue, Da Nang and Haiphong frequently. Most buses arrive at Giap Bat Bus Station, although some private buses drop passengers near Hoan Kiem.